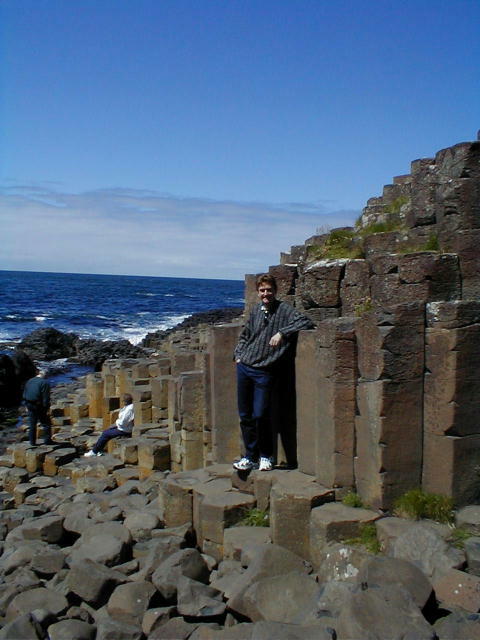 On Sunday we headed off to see the Giant’s Causeway, a natural phenomena caused by a volcanic eruption. The drive was quite pleasant with excellent roads and little traffic. The weather was even better with clear blue skies, although it was still cool! When I was at the coast I had a t-shirt, Canterbury top and a woolen jumper on! This is summer after all :-). Anyway this is a place well worth the visit! I’ll let the pictures do the talking. This first picture is the main view of the area that you seen when you’ve walked down the access road (there’s bus people who need it or for lazy people). 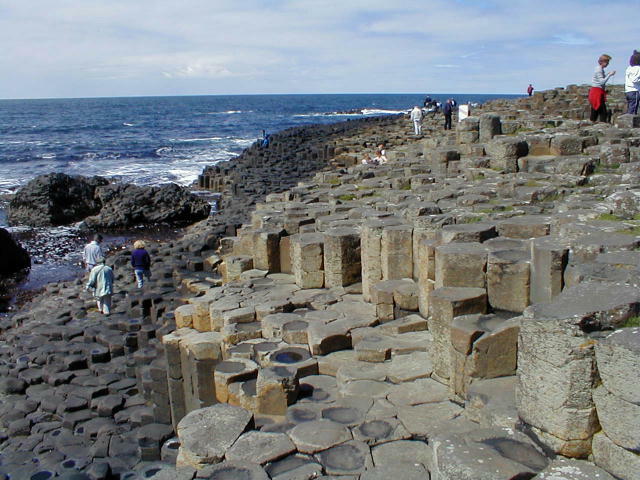 The causeway is the main outcrop of land in the middle of the picture. This is the actual causeway. Amazing seeing rocks formed like that naturally. Better when you are there I guess :). I had to put one of me here, just to let you know that I was really there and I am getting out and about. These pages are not a figment of my imagination after all :). As you can see the formations are quite big. This is a panorama of five shots taken on top of the causeway. 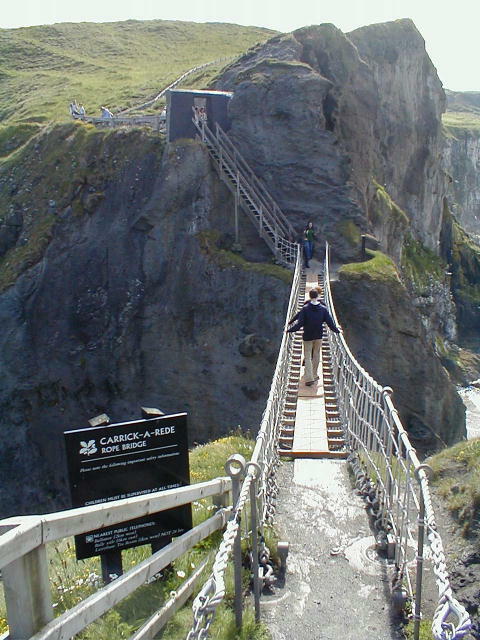 Anyway onward to the next attraction, the Carrick-A-Rede rope bridge. The bridge has been used by fisherman for over 250 years to get to the best places to catch migrating salmon. The waters are often too rough to go out in a small boat so the island location was ideal. A new version of the bridge was finished for the millennium, so I got to walk across on a rather studier version than the original and even that of a few years ago. The original version only had one side rope. The previous one was slightly better with one rope on each side, but with less rigging than the current one. My sister was not impressed when I spoke to her today, as she thought that was half the fun when she did it. Apparently some people still don’t think it’s that safe. About four Spanish girls were coming across the bridge when Christine and I were returning. One girl was given the camera to take pictures of the other girls as they crossed. When they had all crossed they asked her to come across and being the camera. She was too scared and one of them had to come back and get it! This is the view of the bridge upon returning. This is me walking back across. No it’s not a new hair style and I’m not wearing flares, it’s just blowing a gale! This is the view from the top of the cliff that you have to walk along to get to the bridge. 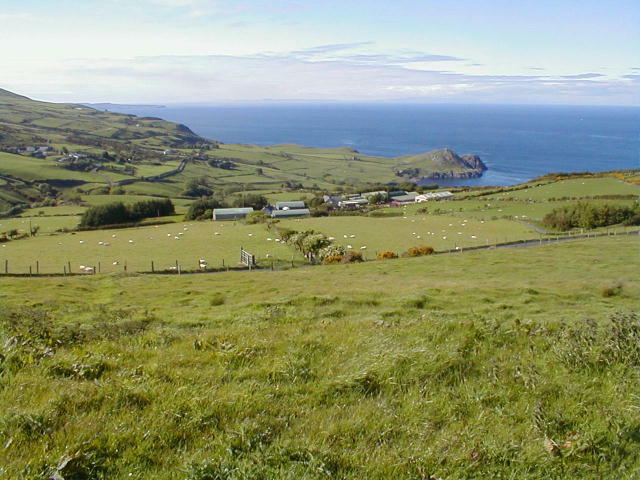 The main island is called Sheep Island. which apparently fattens 9, feeds 10 and starves 11 according to local lore :). 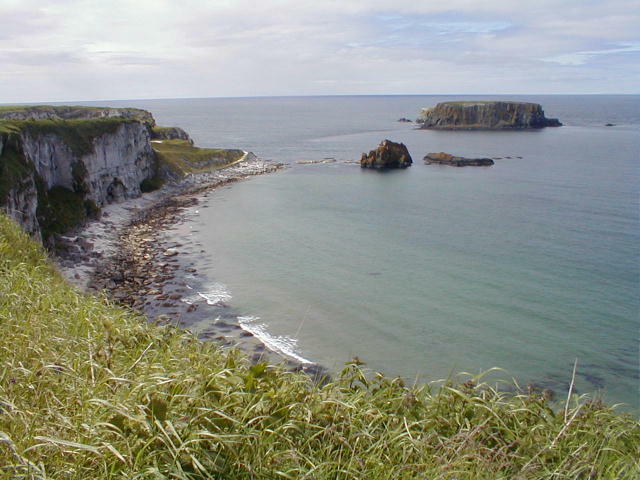 The cliffs were quarried for limestone with some facilities in the area only abandoned in the 1970’s. The small island in the middle of the picture has some construction on it where winding gear was located to send the stone out from shore to waiting boats. 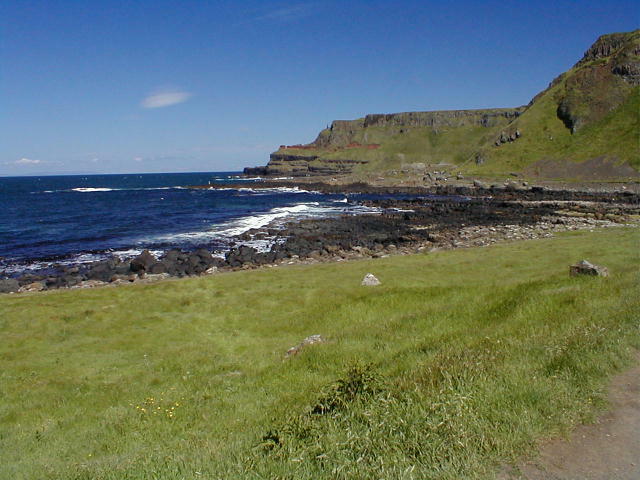 After that we headed down the coast on a scenic route, which is Irish for a road fit for donkeys, but with nice views. 🙂 Well the road itself was actually quite good except for the width. When someone was coming in the other direction it was necessary for both parties to come almost to a halt, avoiding scraping each other or the walls on the sides of the roads. 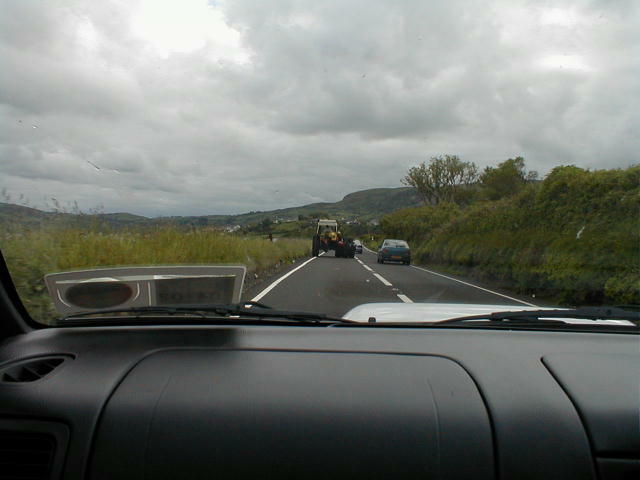 Back onto normal roads on the way home, with the weather getting cloudy we came across this tractor merrily travelling along at around 40 km/h if that. This is where I get frustrated, as many Irish cars do not have the grunt to overtake such obstacles without a runway strip to perform the manoeuvre. I passed three or four cars at once on a couple of occasions in similar situations. Christine fed me before I headed back to Dublin that night, where I arrived home at 11 p.m. It took about 2 hours and 20 minutes to get back from Newtownards, which is not a bad effort. 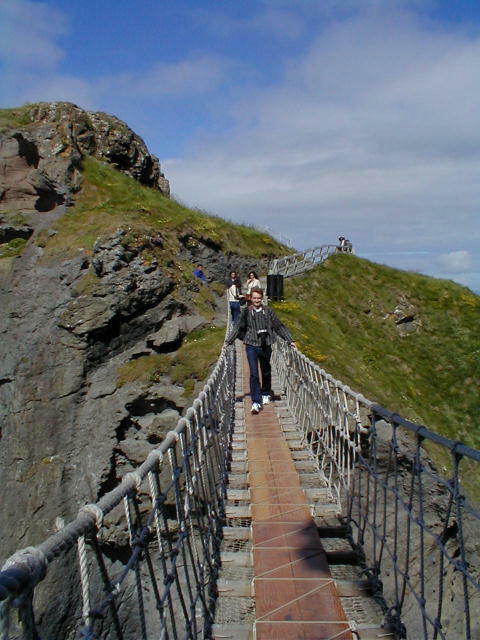 This entry was posted in Northern Ireland, Travel and tagged Carrick-A-Rede Bridge, Giant's Causeway on June 14, 2001 by louco73.